Information about Kaurna Meyunna culture and traditions is gradually being included on various web sites but no site yet hosts a fully comprehensive outline. Karl and Gavin have been working with the City of Charles Sturt for several years on a Cultural Mapping project for the western region of Adelaide which is now available at the City of Charles Sturt Kaurna Culture Web Pages. An occasional article on Kaurna Meyunna cultural tradition and history, and contemporary cultural presentation is also provided here. Within fifteen years of colonisation southern Kaurna Yerta Kaurna Country, part of the Fleurieu Peninsula, had taken on a very different cultural landscape, particularly from the introduction of agriculture and grazing. In 1851 a series of articles Sketches of the Present State of the Colony of South Australia, with Notes of the Resources of the Country, and its Adaption as a Field for Emigration was published in the South Australian Register resulting from a journey made by an ‘Old Colonist’ late the previous year. The articles relating to southern Kaurna Yerta (and some Ramindjeri Country) are reproduced here. Several versions of the Tjirbruki Munaintya Tjirbruki Dreaming are now available on the internet and in various publications with varying amounts of detail and accuracy. Most are based on the writing of the anthropologist Norman Tindale, published in 1987. This has been summarised and updated herewith. In April 1844 the South Australian Register published an account of the disarming by mounted police of Kaurna warriors preparing to defend their Country from intrusion by Aboriginal people from the River Murray region. Mullawirraburka, a leading Kaurna man (also known as King John and Onkaparinga Jack) asked William Cawthorne to arrange for his perspective of the incident to be published. 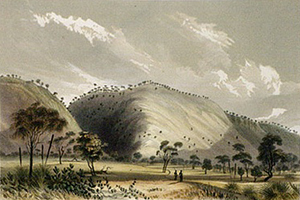 Cawthorne was a teacher and artist who arrived in Adelaide in 1841 and befriended Kaurna. He took a keen interest in colonial life and Aboriginal people. 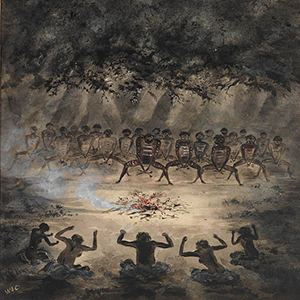 In June 1844 the South Australian Register published a vivid description of the Kuri Dance ceremony. The name of the writer is not given but it was probably William Cawthorne.